3 Aging Mistakes Men & Women Make (right now) & Especially After 50! MY BLOGS » 3 Aging mistakes (both) men and women make now and especially after 50! Dyan here (The Health Coach Is In) with 3 aging mistakes 'both' men and women make right now and especially after 50! Wait a minute, why am I talking about these mistakes we make, anyway? The beauty, health and wellness market is saturated with expensive products and promises that might be doing you more harm than good as you try to look and feel your best. But what if I told you that much of what you read or hear out there is empty hype? And there are NATURAL ways to avoid the aging mistakes that so many of us make? Experts agree that even though genes do play a role in how we age, almost 90% of how we age is due to other factors, like the foods we eat, over exposure to sun and pollution. What this means for you, is that you have way more control over how you age than you thought you did.... yeah! With that in mind, let's dive into the mistakes and how to avoid them, so you can start taking control over the aging process and feel fabulous now and waaay past 50. ARE YOU READY TO KNOW THE MISTAKES? HERE ARE THREE SLIP-UPS BOTH MEN AND WOMEN MAKE! MISTAKE #1: Trying to hydrate with sodas and energy drinks! There are zillions of people, especially over 50 still hydrating their incredible bodies with sodas and the new wave of energy drinks. As the years go by, our bodies literally dry up from the inside out! Our skin just can't retain moisture like it used to back in the day when we were plump little infants, storing water like desert succulents. Sodas and energy drinks may quench your thirst on the spot, but they don't hydrate your system in the long run, like H2O. Because they are jammed packed with artificial flavors, chemical preservatives and acidifying agents that can lead to cancer, heart disease, diabetes, osteoporosis and tooth decay. DRINK WATER, DRINK WATER, DRINK WATER! Drinking water is the true Fountain of Youth. It is all your body needs to stay hydrated! So how much water should you drink? The best rule of thumb for men is at least 64oz (eight glasses, daily) and for women at least 48oz (six glasses, daily), but don't go a day with less than five glasses. It takes 5 glasses a day just to keep the toxins (crap-o-la) moving out of your unique physique. So drink up and keep your magnificent body hydrated. AHH! THE BEAUTY OF HERBAL-FRUIT WATERS! MISTAKE #2: Over Exposure To The Sun! It's common knowledge that ultraviolet (UV) rays is harmful to your skin, because it damages skin fibers called elastin, which makes your skin stretch and sag like an old cracked and dried up rubber band. THINK SUN-KISSED... NOT SUN-DRIED! Vitamin D is vital for a healthy gut, bones and blood. So go out in the sun and enjoy, but if you're going to be under the glorious warmth longer than 20 minutes, wear a sunscreen with an SPF 30 or higher, preferably one that is chemical free and contains natural ingredients. 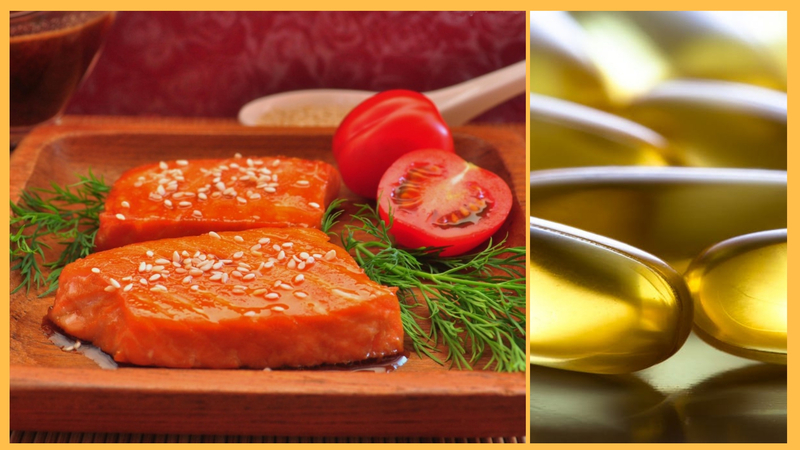 MISTAKE #3: Underrating the value of heart healthy essential fatty acids! The older you get the harder your body has to pump blood to your heart and brain, because age slows down the body's functioning and puts a strain on your heart and your body's immune system. But the good news is that the Omega-3's found in fattier fish, like tuna, haddock, shrimp, wild scallops, king crab, wild herring, cod, salmon, halibut, cat fish, sea bass, flounder, anchovies and lake trout are nature's gift to anti-aging. Omega-3's are known for significantly reducing inflammation in the body, which is a symptom related to many age-related diseases, such as heart disease and dementia. Dine on fish and seafood a few times a week and take fish oil supplements (1000mg-2000mg) daily of a reputable brand with no pesticides or heavy metals. This is one of the best ways to keep your skin healthy and supple with fewer wrinkles and support your hard working heart and immune system at the same time. Check out my post next week to learn the 3 AGING MISTAKES we "WOMEN" make now and especially over 50.